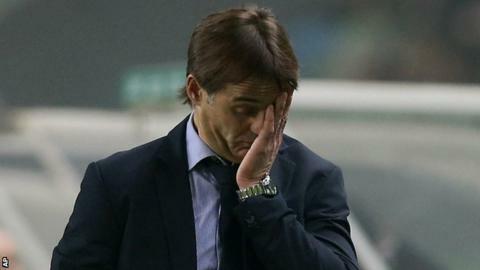 Porto have sacked manager Julen Lopetegui despite losing just one league game this season. The 49-year-old Spaniard, appointed in May 2014, has overseen a Champions League win over Chelsea this season. However, the Portuguese club said in a statement to the Lisbon stock exchange that its board "decided to replace the coaching team led by Julen Lopetegui". Porto have gone three games without a victory, including a 2-0 loss to leaders Sporting Lisbon. They have not won the Portuguese title since 2013 and are now four points behind Sporting. Former Chelsea manager Jose Mourinho led Porto to two league titles and the Champions League when he was in charge between 2002-04.